This is the most un-Tarantinoesque of Quentin Tarantino’s pictures, faithfully adapted by the director from an Elmore Leonard book. 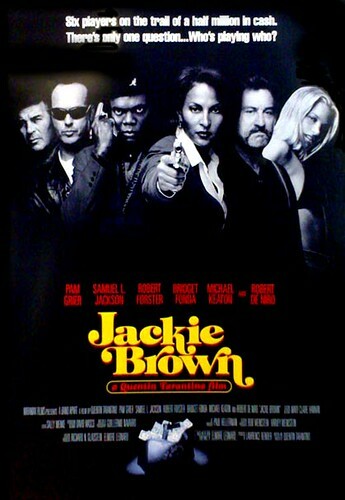 A flight attendant (Pam Grier) gets caught shuttling money and drugs for a gun seller (Samuel L. Jackson) and caught in between the ATF (represented by Michael Keaton) and Jackson, she devises her own scheme to steal all of the latter’s funds while extricating herself from prosecution, enlisting the help of a bail bondsman (Robert Forster) in the process. Tarantino’s pace is languid, his body count minimal, and the film features long stretches of sharp dialogue and silent character reflection. As Jackson’s scheming girlfriend and dim accomplice, Bridget Fonda and Robert DeNiro shine in a cast of apt, funny secondary characters. This is a clever and straightforward crime story. I don’t really know anything about Miami. I had never been to Miami before. One of the things Elmore Leonard has to offer in his novels, is an expert sense of both Miami and Detroit. He has got his Detroit novels and he has got his Miami novels. I can’t compete with that, and Miami is very hot! You don’t want to got there to shoot! One of the things I do have to offer is that same kind of knowledge about Los Angeles; partly in the area that the area is shot in, in the South Bay. It is not used that often. Tequila Sunrise used it a little bit, and a few other movies have touched on it a little bit. I am very familiar with that area because I grew up around that area. It is one of the things I could bring to the piece; an expert knowledge of that area, the way he brings an expert knowledge to Miami. While Jackson uses the “n” word with his usual vigor, the script is refreshingly shorn of the showy pop culture references found in Reservoir Dogs and Pulp Fiction. It’s also a lot moodier than those pictures. The plot, however, is not wildly intricate and certainly doesn’t justify a 2 and a half hour running time. Also, while Tarantino loves reclamation projects like John Travolta and David Carradine, Pam Grier and Robert Forster are bridges too far. Neither are particularly good actors, and while Forster’s wooden approach isn’t terrible given his role, Grier is key, and she cannot convey the emotions necessary to really bring the character home. She was a B picture star in the 70s for a reason other than acting.